Yes, you read that headline correctly. No, really. 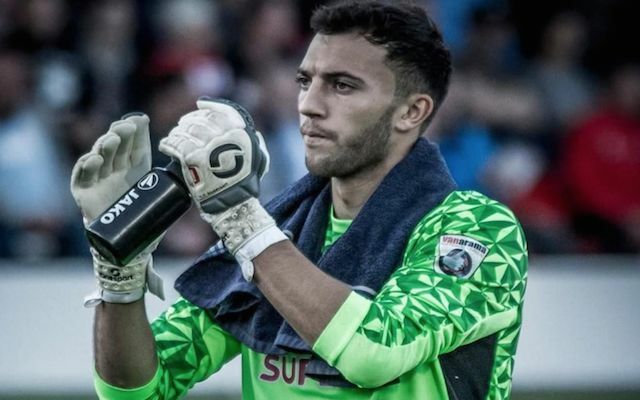 Salford goalkeeper Max Crocombe was dismissed on the 86th minute during the club’s National League North fixture against Bradford Park Avenue for urinating on the pitch. When you have to go, you really do have to go it appears. 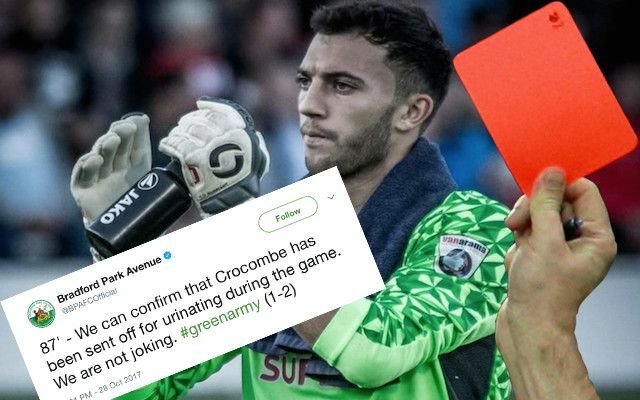 The initial reports suggest that as soon as the referee became aware of Crocombe’s toilet break that he marched towards the keeper to issue him with a red card. The news broke in hysterical fashion on Bradford Park’s official twitter account and of-course it sent everyone into a meltdown including Gary Linekar. Below is an Image of the ‘keeper in question. Salford midfielder Richie Allen was given the unfortunate job of replacing the dismissed Crocombe between the sticks as a make-shift goalkeeper for the remaining minutes in the non-league clash. It goes without saying that Allen was unlikely to be too happy at the prospect of diving around in what some would now deem as a waterlogged pitch. The bizarre incident did not undermine the efforts of Crocombe’s side. Salford were able to cling on to their lead and secure the three points despite the dampener (get it!) on the events. Special moments like these do really highlight the unpredictable nature of sport. Who can forget the time Paula Radcliffe had to stop for a poo during the 2005 London Marathon as reported by the Daily Star. Further, Gary Lineker’s career achievements are often eclipsed by the fact that he sh*t himself during an England tie with Norther Ireland. And, what about that time NRL star Todd Carney was caught urinating in his own mouth. You can see that incredible disgusting achievement here. But what about the time Jens Lehmann managed to get away with having a quick toilet break? Perhaps, Crocombe needs to take a leaf out of the big German’s book before he tries any similar antics again. Sport really does provide some iconic and beautiful bizarre moments and being sent-off for urinating during a match certainly deserves it place in our hall of fame. We salute you, Max Crocombe. Twitter of-course exploded in incredible fashion following today’s news. Here are some of the greatest reactions to the news.